Last Saturday was our first sketch outing at the Fakahatchee StrandPreserve State Park for the year, as well as the WorldWide SketchCrawldate. We had a wonderful turn-out for our group, and beautiful weather. With so many interesting subjects, it was difficult to choose just one or two! 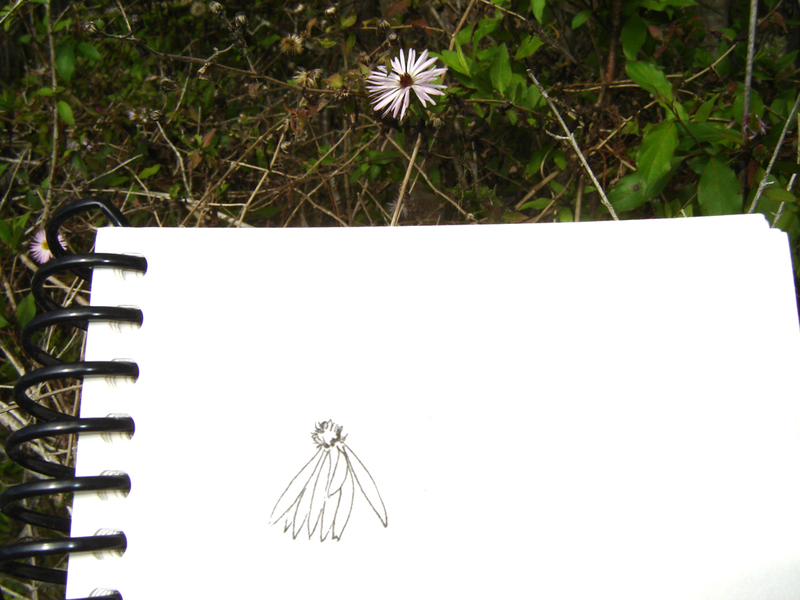 Starting the sketch, using dots as a reference for the petal placement. As usual, I found myself looking at the small things. Along the edge of a wooded area, a flash of lavender and yellow about eye-level lured me over. Growing in a tangle and wandering up the trunk and branches of a bald cypress was the largest climbing aster (Aster carolinianus) I’ve ever seen before. It was in all stages of bloom, from flower-buds to seed-heads. I quickly sketched it in ink (dodging the numerous honeybees) and moved to a nearby picnic table to add color with my watercolor travel palette and waterbrush. After completing that page in my sketchbook, I checked the color choices with the vine in question and noticed a small broken branch hanging precariously among the other branches. What caught my eye this time was the unusual airplant growing from the lichen-encrusted bark. 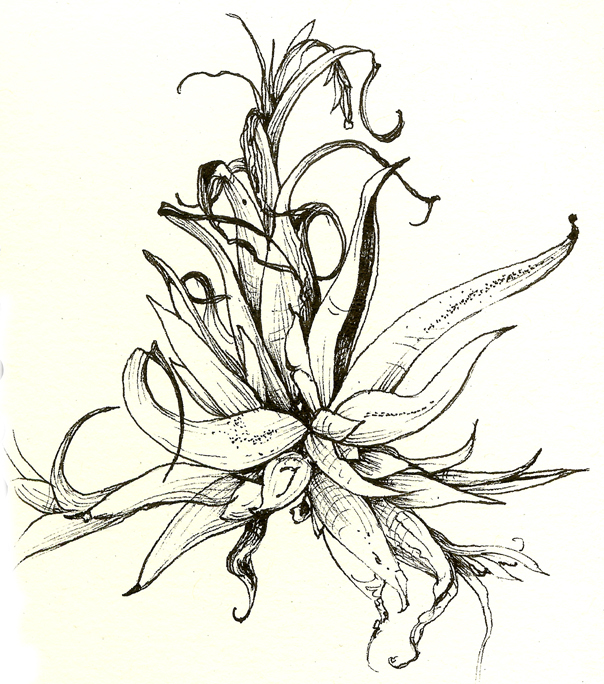 Luckily I had brought a reference book or two, and with the help of a friend decided it was the potbelly airplant, Tillandsia paucifolia. I don’t see these very often and was excited to sketch it! I was able to complete an ink drawing, but with no color, as our time was drawing to an end. After taking a reference shot with my camera, I carefully hooked the broken branch back onto a sturdier branch so it wouldn't fall to the ground. I wasn’t able to draw the many tiny seedling “pups” that were growing on a seedhead, or the different lichens,but perhaps that’s for another time. I was told that one of the lichens was named “old man’s beard” – I’ll leave you to guess which lichen it is from the photo below! You can see a slideshow of our get-together on the Events Page here. 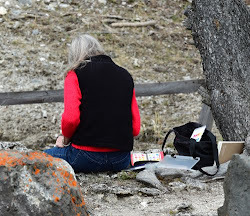 This time of year it is always a surprise to me to see that someone is sketching outside. It is so darned cold here. Brrrr. 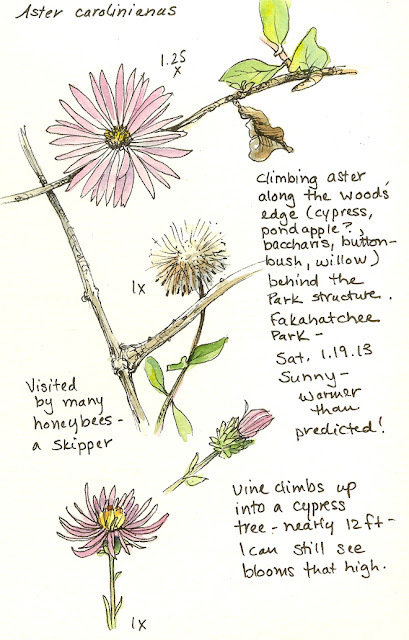 I love seeing the wild plants you find to sketch. Great. I have never seen an air plant like this one. 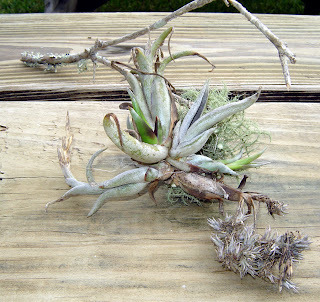 Air plants are all the rage right now. "Warmer than predicted" sums up the winter we've had so far! I would prefer it to be a little cooler, but at least we can get outside to sketch or ride or whatever our little hearts desire. 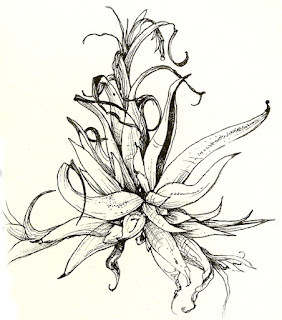 Pretty sketch of the aster, and the ink drawing of the airplant is wonderful. 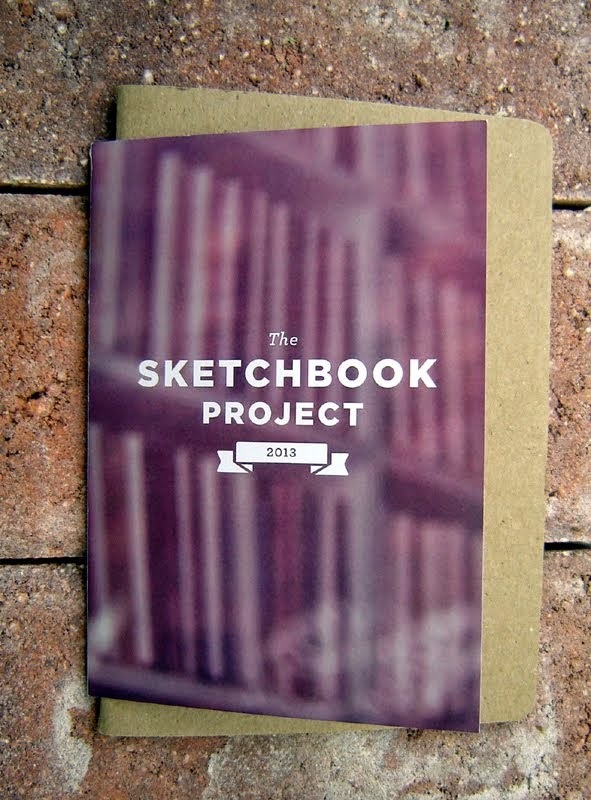 Looks like a really nice day of sketching. I enjoy your blog very much. Trying to get a sketch group together here in North Central Florida - Lake County and the Villages. Hope I can be down that way when you group gets together for a sketchcrawl sometime. Hello Lisa - sorry to flaunt our warm weather at you. :) I'm originally from Iowa, so I remember vividly how cold winters can be. Thanks so much! I like to find and sketch the things that others overlook or don't care for. It was a very nice day, well-earned after our terrifically hot and humid summer. Thank you Kathy! Yes, it turned out much warmer than the weather people mentioned - I wore long sleeves and jeans,and had brought an extra jacket - the good news is that I was protected from the sun! I would like cooler weather as well, but am glad to be spared the deep bone-chilling cold that many are getting now. Lee, thank you very much! You're welcome to join us if you are in the area and we've got a plan to go out. Don't give up too soon on getting a group together, it took us a while to do that! This is really wonderful sketching. You are such a great Artist. I have great collection of beautiful trees. You can create more nice sketch.